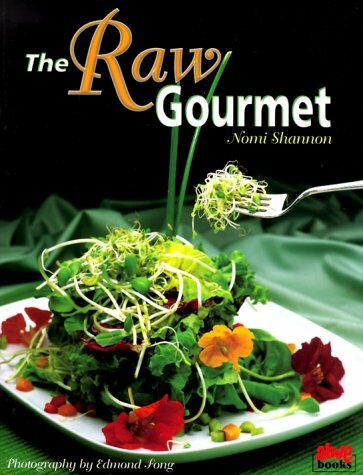 "Gourmet raw cuisine"--if that sounds like an oxymoron, you'll be amazed by the creativity of the recipes in this book. Every food is "live" (uncooked) in these vegetarian recipes from Juliano, the raw-food guru of Los Angeles. Juliano believes that fruits, vegetables, nuts, grains, beans, and seeds in their rawest and purest form are the most nourishing foods. If your imagination stops at alfalfa sprouts and grated carrots, hold onto your cutting board. Juliano's recipes include Butternut Squash Soup, New Moon Fruit Stew, Thai Green Papaya Salad, Living Buckwheat Pizza Crust, Mango Essene Bread, Mock Salmon Sushi, Raw Spring Rolls, seven varieties of burritos, nine varieties of pizza, and nine unusual smoothies. Desserts? Try EZ Pudding (made with maple syrup, avocados, and carob powder) or Cashew Gelato (cashew butter, maple syrup, and almonds, served frozen). There are also condiments, dressings, and sauces, and plenty of information about preparing raw foods, including how to soak and sprout beans, grains, seeds, and nuts. Maybe I'll make something someday! I have plans to get a dehydrator and am looking forward to trying some of the "baked" products. Juliano is an intriguing figure and I'd be curious to see him as a guest on the food network! If you live near a specialty foods store where obtaining the ingredients can be easy and cost effective (a difficult combination, to be sure) you'll do well with this book-- if not, maybe you'll just enjoy looking at the pictures like me! Other reviewers have pointed out the frustration that many of the recipes call for other recipes in them. An easy solution (though cheating) would be to just use the "real" item (if you are not a staunch raw foodist). Instead of making the "mellowkraut" just pop a can of saurkraut and there you go. Or just use real cheese instead of dehydrating sheets of fake cheese which only keep for three days anyway. Don't kill me for saying it, Juliano! But you work in a restaurant making this stuff all day and most of us just have half an hour to prepare our meals! The reason this book gets four stars is the slightly annoying "food substitution" that the author often employs, noted by a former reviewer. "French fries" are avocado slices wrapped in cheese-substitute. "Mashed potatoes" is cauliflower, nuts, and herbs in a blender. I thought it took nerve to actually have a recipe for salad which is basically "take whatever is in your refrigerator, chop it up, and put dressing on it." I think everyone makes that recipe sometimes, without the aid of a cook book! If I had payed full price for this book, I might like it a lot less-- but as it stands, I enjoy flipping through it and plan to use it (eventually!) to prepare healthy drinks, snacks, and foods for my daughter (once she's old enough to eat!) Viva vegetarian! 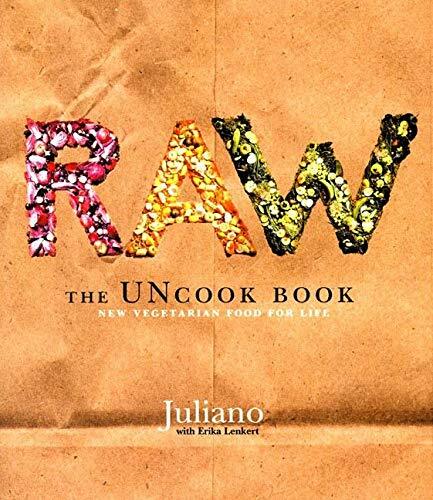 When I first looked through juliano's cookbook, I was attracted to the colorful photos of raw foods. I had been vegan for a few years and had doubts about the nutritional quality of what I was eating; with raw food recipes, I've had no doubt. To me, everything in this book, with the exception of the "cauliflour mashed potatoes" tastes great. A person who is accustomed to a "typical American" diet including butter, meat, pancakes and casseroles might not think so, at first. For me it was a good introduction to raw food cooking. I do think it's silly that Juliano names many of his dishes after cooked foods that bear little resemblance to the raw food result, and I did substitute and modify the recipes when I didn't have all of the ingredients or didn't like something; however, it serves as a great template for raw foods and has some nice photos of the food. It's perhaps not as good as some others, now that I've read more (ie The Raw Gourmet), but I would definitely include this in my raw food library. The person who wrote about the "Meat loaf" recipe must not have read the recipe: it calls for a total of only 1/2 cup olive oil. There are also a lot of nuts in it but 1. nuts are healthy and 2. you're not supposed to eat the meat loaf everyday! There are plenty of light recipes here as well. It's like taking ANY cookbook and pointing to the dessert section and saying "Ah ha! look at all this fatty food! What a bad cookbook." Give me a break. I like this cookbook. It's gorgoeus, inspiring and the recipes are good. I am SOOO glad I got this book from the library FIRST! I recommend that. I am a Michigan mom that is into healthy foods, where organic food is quite costly. I'm a health educator with nutrition as a major and I am always interested in new and exciting ways to be healthy, prepare vegetables, and healthy food. BUT....JUST in case you are not totally engrossed in RAW food yet, I recommend you borrow it. I read about this book, and its author from a Fitness magazine I read. It sounded GREAT! I thought it would be a great book to get recipes for my juicer and learn some other healthy recipes as well. Well, I sat down to read/look at the book, it has beautiful pictures and text, and some fun sounding recipe titles etc. But I soon realized that this was not going to work for me and my family. I have 2 kids ages, 5 and 3, and a husband that is healthy and fit, but would not touch most of this stuff with a 10 foot pole. I would be putting a LOT of time and preparation into stuff that only I would probably eat. This type of dieting is a bit over the top. And may be fun once in awhile. It would be a fun trip to his restaurant, to have SOME ONE ELSE make it. Juliano is as interesting looking as his food. But unless you are totally committed to this way of life, you may be totally flustered by the amount of time and energy it will take to sprout, dehydrate, chop and chop, and prepare more than half the stuff in this book. The list of ingredients is also daunting to say the least. Anyway, I suggest you get the book from the library first, and see if this is what you really want. It saved ME some money! If you are a single vegan, or have kids and a spouse that can handle all the vegan ingredients, and they don't mind you living in the kitchen preparing, and/or if organic produce is readily available and affordable to you, than this book is for you. I applaud the healthy ideas, colorful foods, and interesting recipes, but be sure you have the time, or care enough to spend your time on this. I can't recommend this book highly enough. 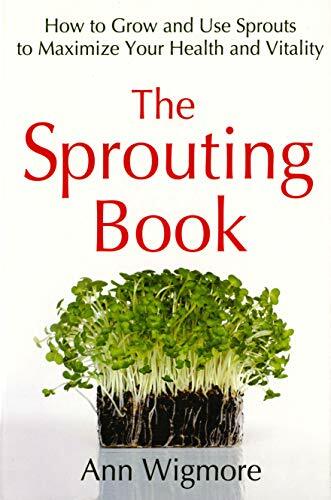 I was on the way to raw food when I bought this book, so I was sprouting and already had the dehydrator. However although I was preparing raw meals using recipes I got off the web, they weren't always the most tasty and they seemed to be settling into a pattern of boring repetition. I was feeling doubtful about maintaining this approach although I felt the health benefits of it. Juliano's cookbook has opened my eyes to the potential of raw food. This book is full of delicious recipes that are easy to make. Raw soups take seconds to blend up. Having raw condiments on hand for new flavours. Yes the dehydrating takes up to 24 hours, however unlike ordinary cooking where you have to watch the food and check it all the time, dehydrating just goes on in the background while I get on with my life - and because I can cook in bulk, the breads stay fresh and tasty for weeks. The detail and the photos in the book are great, and so is the flexible approach where if one ingredient or three are not available then we are encouraged to improvise. Are you concerned about the freshness of commercial baby food? Are you frustrated with making separate meals for your picky eater? Would you like move toward a plant-based, whole foods diet?Familiesall over the country have found satisfying, delicious answers to thesequestions and more in Cynthia Lair's Feeding the WholeFamily. There are over 150 family-tested recipes using wholegrains, beans, vegetables, and fruit.Each recipe contains suggestionson how to transform dishes parents will loveinto food for babies andyoung children.Plus the book contains valuable insights onbreastfeeding, starting solids and how to attract children to healthyeating. Feeding the Whole Familyalso features an extremely handy"Identifying, Shopping, & Storing Whole Foods" glossary, a completeindex and delightful stories and illustrations.The book is bound witha special binding that lies flat. Three cheers for Cynthia Lair's Feeding the Whole Family! From baby's first cereal to recipes that adults love, this book is packed with delicious, nutritious recipes. The recipes are mostly simple and easy to make, and the nutrition advice and cooking instructions for grains and beans are constantly useful. Having a kid is a great incentive to start eating healthy if you don't already, and Feeding the Whole Family helps you do it without spending all day preparing different food for everyone in your household. Try Cynthia's version of Bathing Rama with udon noodles! I double this recipe every time I make it because it is so popular in our family. 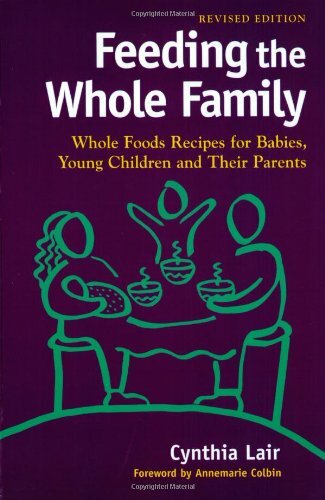 Get this book and discover how easy and delicious it is to raise a healthy family. And, yes, your kid (and you and your partner) will love broccoli and kale and seaweed, too! Excellent Resource For New Moms! 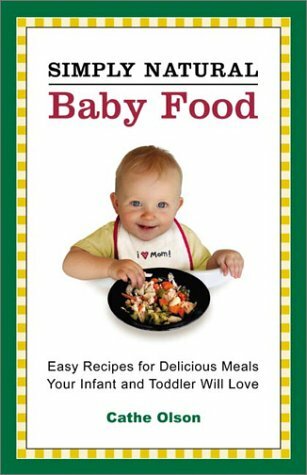 This book gives the basics of how to feed a baby natural foods you cook yourself. It includes sections on when and how to start solids, safety tips for homemade baby foods, foods not to feed babies, and healthy eating for the older child. Included are many healthy recipes. The recipes include variations for babies and older children. Nutritional analysis for all the recipes as well as a glossary and index are included. The Whole Family Loves This Food! I took a chance buying this cookbook without knowing anything about it. The recipes are excellent! My entire family loves the meals I've made so far. I haven't come across a dud recipe yet! Healthy and Highly recommended! Excellent resource for new moms. This is a VEGETARIAN book with one recipe for chicken breast. There is no milk, no eggs, no yogurt unless you want to count putting a dollop of yogurt on top of a bean burrito. 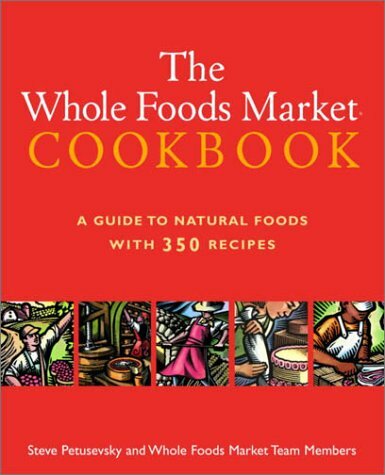 I researched what "whole foods" means and this book is NOT it. This is a vegetarian SOY BEANS book. She uses tofu, tempeh, soy milk, tamari, and shoyu ALOT! And then she recommends you read the labels of the cereals in the store and pick a good one! There are no good ones! That's why I bought the book. Duh! For John Ash, author of the award-winning From the Earth to the Table: John Ash's Wine Country Cuisine, the lines that separate chef from teacher from cookbook writer from consultant blur and fade into insignificance. In the end, it's about ingredients and flavor and the meal at hand. 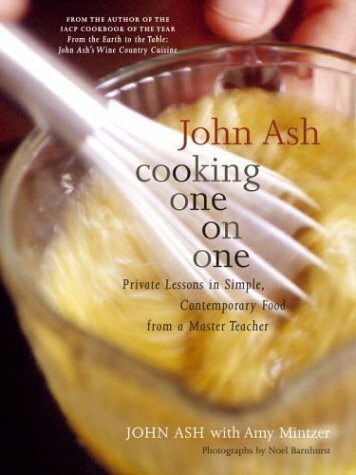 "After twenty-five years of teaching," Ash writes in the forward to John Ash: Cooking One on One, "I know that you don't have to perfect all the basic kitchen skills in order to make great food." What John Ash likes to see coming his way is a good eater, because there's a person who as likely as not will want to taste and eat at home what he or she has tried out on the town. The trouble, of course, is time. Or you are single and aren't cooking for more than yourself. It's all so daunting: eating light, eating well, eating responsibly. And ordering take-out is so easy. Cooking One on One, in chapters constructed like lessons, dispels all that. Part One is devoted to flavor-makers--salsas, vinaigrettes, pestos, world marinades, and simple, savory sauces. Learn to make the cucumber and mint salsa, Ash instructs, then use it to maximum advantage with grilled lamb chops. No muss, no fuss. That which begins at a simple level grows more complex as you master technique and ingredient and apply layers of flavor. Ash leads the way with flair and confidence. Part Two covers basic cooking techniques--learning about soups, learning about oven-drying ingredients like tomatoes or cauliflower for maximum effect, learning about braising, grilling, creating soufflés (they can be assembled and frozen ahead of time! ), learning about pasta in the West and the East. Part Three covers lessons in main ingredients: chicken, dried beans, mushrooms, salmon, shrimp, soy foods, desserts. The straightforward recipes reflect the nature of the lessons, the ingredients, the flavor profiles. This is a California chef with deep respect for culinary roots, whether they reach back to the Colorado barnyard or the French farm. My husband and I have attended two of John Ash's cooking classes in the last several years. If you ever have a chance to go to his class, don't miss it. He teaches with a wonderful sense of humor while passing on all kinds of good information. He usually makes the circuit at the Central Market in Austin, Dallas, Houston and Ft. Worth, TX. We attended in Austin but unfortunately don't live there anymore. His cookbooks are wonderful and are filled with very interesting, different, and excellent recipes. This one is good. This is marvelous new approach to teaching culinary techniques. It is very similar to Ming Tsai's new book: "Simply Ming" in that they both provide a new technique, e.g. how to make a marinade, a vinagerette, a sauce, souffle, braising, etc., then provide recipes which use and build and modify this basic. While Ming is into East-West fusion, here Ash is into inspiring even the one who feels they are not very good in the kitchen to delve into the fun world of great cuisine. Ash is a proficient educator who truly believes in dialogue as a prominent learning tool. Here he aptly anticipates questions and answers them. His selection of topics is contemporary and popular, as evidenced by his starting point: salsas. This is topped off by a wonderful "Fresh Cranberry and Tangerine Salsa." I really appreciate that each topic provides "VARIATIONS", which stimulate each of us to consider taking off in varying directions depending on our taste likes and ingredient leanings. There is also a section on Tofu (not one of my favorites) and Simple, Sophisticated Desserts. A wonderful, informative brief section on wine, both for cooking and for matching up with food is well done, as well as a Glossary and Pantry. Only thing missing here is Sources. The writing is superb as is the color photography. A cookbook to start with, improve with and cook with for a long time. Author John Ash's rare combination of a professional chef's experience combined with a teacher's ability to communicate has produced this remarkable and welcome tutorial on how to execute various cooking tasks. The book lives up to the many blurbs from culinary luminaries headlined by a quotable from Emeril Lagasse on the front cover. The book is so good, it enhances my opinion of the commending writers for having the foresight to endorse the book. On a very glib level, the book is a cross between Alton Brown's knack for explaining with Tom Colicchio's depth of culinary insight. The first stroke of genius is the organization of the chapters into a section on 'flavor makers', a second section on techniques, and a third section on important ingredients. Learning about cooking has often struck me to be very similar to learning about chess. For the millions of combinations of ingredients (moves) there are really just a few simple rules one can learn with hundreds of variations posed by the moves of your opponent. One simply cannot learn chess by studying. You can only learn by playing (cooking) and by slowly gaining first hand experience with ingredients and the results of applying techniques. The author has accommodated this analogy by dividing cooking into three areas of discourse, loosely comparable to the opening (ingredients), middle game (techniques) and ending (flavor makers). I am sure this analogy will not bear too much analytical weight. It succeeds if it highlights the fact that you must learn cooking by actually working with foods and experiencing its behavior, smell, and taste. I have occasionally been disappointed by such promising titles such as Tom Colicchio's 'How to Think Like a Chef', but my disappointment has been part of the lesson and not a failure of Colicchio's book. He gives lots of recipes and very few general principles. Ash's book is no different in that there are only a few general principles and plenty of recipes, although the genius of Ash's presentation makes the book satisfying all the way through. While Colicchio and Charlie Trotter and Eric Rippert, great chefs all, have written inspired books about cooking in general, Ash is a professional educator as well as being a talented chef. One way of viewing Ash's book is to see it as a visit from the Snap-On tool supply truck. Reading the book furnishes your mental toolchest with eighteen (18) tools that can be used in a broad range of applications. My favorite example is the lesson called 'Vinaigrettes: Not Just for Salads'. As the title indicates, vinaigrette is one of those 'Swiss Army Knife' preparations like a marinara sauce. It can easily be used in a lot of different situations with great results. Ash doesn't limit himself to the olive oil / vinegar / mustard / shallot / salt and pepper classic and it's applications. He brings in citrus as the acid, stocks as part of the liquid, honey, miso, soy sauce, ginger, cilantro, and dried fruits. He extends the lesson to advice on how to pair vinaigrette to the composition of other elements in a dish or a meal. I also welcome his mentioning of a brand of corn oil prepared in a way which calls up the picture of artisinal olive oil production. The oil, he claims, actually tastes like corn. What a concept! The lessons on the other four 'flavor makers', Salsas, Pestos, Marinades, and Sauces all follow the same pattern of broadening our understanding of these preparations. The greatest contribution of all these chapters is not that they show you how to make these specific eight or ten or twelve recipes. The contribution is that they show you how to improvise with these ingredients. I can still remember the revelation I experienced when I realized that pesto / pistu is not just for pasta. I was amazed when for the first time I saw it being used as a garnish to soup. There is a lot of this kind of horizon expanding exposition going on in these pages. The selection of topics for techniques and for ingredients is equally inspired. In a sense, there is even more illumination in these sections than in 'flavor makers' since both sections contain at least one surprising topic. Techniques gives us a lesson on oven drying, a method which I have seen used here and there, now and then, and highlighted as a general tool only in books covering Raw Foods techniques. Ash brings the technique into the main stream as a routine tool for the home cook. The ingredients section includes a chapter on soy foods which has a distinction between Chinese and Japanese tofu, the first time I've seen this distinction made. This section also discusses miso, relatively new to American culinary vocabularies, and Tempeh, which may be quite new to most Americans. I do not know much about wine, but I welcome it in all sorts of cooking applications. Therefore, I was delighted to find that the final essay was a concise, excellent discussion of wines as they are used in cooking. True to the end, the book's food facts are accurate in it's addressing the question of whether cooking drives off the alcohol. The book's discussion of the issue is deeper than any other I have seen, in that it gives estimates of how much alcohol remains after various cooking techniques heat the added alcoholic ingredient. The discussion is crowned by a clear explanation of what alcohol adds to dishes in language that makes sense to educated lay cooks. There is none of the meaningless statements that alcohol is 'a conductor of flavor'. This book is not a complete text on cooking methods. For that, see, for example, Madeleine Kamman's 'The New Education of a Cook' But, this is an exceptional cookbook which really should be read from cover to cover. Very highly recommended. Intermediate to advanced recipes, but good advice for novices. Close your eyes and buy this book, Mr Ash cooking is not only an insparation, but the ABC's of future food to come, his simple techniques comes from years of experience and knowledge. This book is for keeps. Whether you'd simply like to add more fruit and vegetables to your meals, or want to change your lifestyle in a more dramatic way, The Raw Gourmet is the complete guide to one of the world's fastest growing nutrition and health movements-the living-foods diet. In the first book of its kind, Nomi Shannon opens a door onto a refreshing new world of food preparation...Learn how fresh, non-cooked fruits, vegetables, nuts, seeds and grains can boost your vitality while lighting up your palate. ...This is one of the most beautiful recipe books I've ever seen; it doubles as a nice coffee table book! I've always loved cookbooks that show you what the finished recipes are supposed to look like, especially when I'm new to a certain style of cooking (or in this case not cooking). Her book is over-the-top wonderful with lovely photos on every page. Another thing that makes this book so different from other raw "cookbooks" is that Nomi shows you to find the time to prepare raw meals, sprout, etc. Extras include "Ten Raw Food Kitchen Essentials," a sprouting chart, information about food combining, a 3-week menu plan, and so much more! The recipes are as varied and wonderful as any cooked food you've ever eaten, from breakfast grains to juices and salads to pies, cookies, and ice cream! Check out the table of contents to see the incredibly long list of different kinds of recipes she has included in this fabulous book. You won't believe how much you can do with raw foods! I also liked that she includes a notation that shows you which recipes are "properly combined" for those new to food combining. If I had to choose only one of my raw foods recipe books to keep, it would be this one. I have followed healthy eating habits for about 10 years with great results. I began with "transitional" type cookbooks and gradually became more raw over time. Great tasting and easy to follow recipes are contained in this eye appealing book. For the beginner in this type of eating some of the ingredients may be a bit challenging to find if you don't have access to a quality health food store. A little perseverance is well worth the effort. This book does have beautiful pictures!! And the recipes are mostly not too complicated!! But it is not a basic book for a beginner...for much of it you need those harder-to-find ingredients, AND a kitchen full of uncommon appliances to prepare this stuff. This is a very beautiful book, and is worth buying just for the spectacular food photography. There is also a lot of useful information for dishes going beyond fruit and salad, and hints for preparation. If, like me, you are seriously considering adding one or more raw meals to your diet, this book will be helpful. Unfortunately most of the meals seem to require a bit of preparation or planning (soaking) and a Champion juicer or similar food processor. (The blank screen on the Champion emits both juice and pulp together instead of seperating the juice). 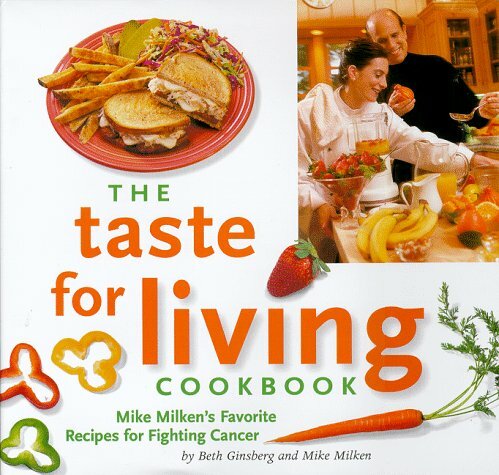 When Michael Milken was diagnosed with advanced prostate cancer in 1993, he wasted no time switching from his daily egg-and-bacon-sandwich breakfasts to a low-fat, vegetarian diet. He also founded CaP CURE, the Association for the Cure of Cancer of the Prostate. Through research supported by CaP CURE, Milken learned that cutting down on fat was not enough--that soy protein could be an important missing ingredient in his diet. He duly incorporated all of the cancer-fighting ingredients into his diet, but he missed the joy of eating. 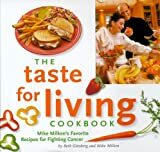 The taste For Living Cookbook Mike Milken's Favorite Recipes For Fighting Cancer is a nicely photographed book. The recipes are basic health food fare. Cut down on fat,avoid meat, eat lots of veggies and soy. If I was a wealthy man I would have a professional chef move into my home and cook these complicated meals im my professional kitchen. I would also go to a medition center in Massachusetts "based on Ayurveda tradition" and I would "invite a doctor trained in both Western and Ayurveda medicine to move into...our house for a few months" I don't mean to be cynical but I have neither the time or money to follow this books recipes. I did not find this book very helpful . Mike Milken's Favorite Recipes Are My Favorite Recipes Too! I like to eat healthy because I want to prevent cancer. This recipes are for everyone, not just for cancer patients. 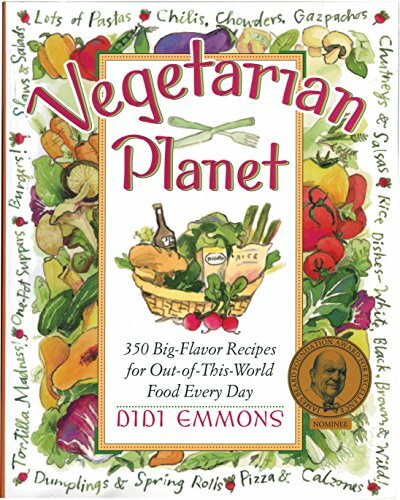 I am an 18 year old vegetarian and I love the recipes in this book. They are proof that you can eat great food and stay healthy at the same time. The belief that something good for you has to taste awful is just a myth. Just try the recipes in this book and convince yourself! The book presents recipes attractively. I've tried a few and they were easier and better than I expected, given the somewhat unusual ingredients for familiar foods. The book goes astray, to some degree, in my opinion, because it works too hard at recreating unhealthy high fat foods with low-fat, high-soy, equivalents. Better to just present vegetarian recipees that don't try to seem like something else. 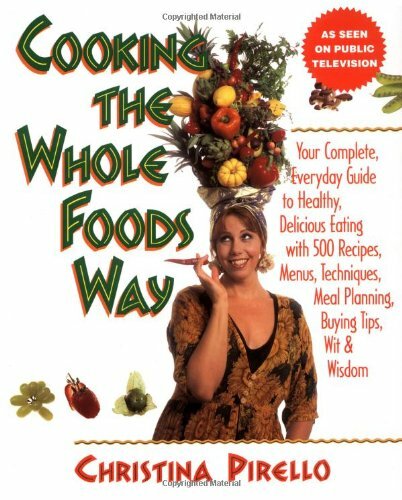 I purchased this book because it contained recipes like flan that didn't require any dairy products. It also provides some great tips for substituting out ingredients like cream and other milk products without sacrificing texture and taste. The world has grown increasingly curious about the benefits of soy in recent years. Not only is it a dietary staple of the people of Okinawa, who live longer than anyone else, it also seems to help prevent heart disease and breast and prostate cancer. 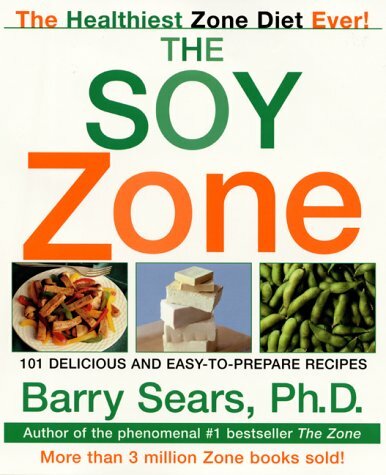 So author Barry Sears has now modified his popular Zone diet to include soy and made the whole thing just as easy to follow as before. Fill a third of your dinner plate with a dish high in soy protein and the other two-thirds with fruits and vegetables, and you've got the Zone dialed in. Not surprisingly, Sears is just as down on starchy foods--potatoes, pasta, rice, breads, and cereals--in The Soy Zone as he has been in his past books. He says they trigger too large an insulin surge, which leaves people feeling sluggish a couple of hours after the meal, and sends them chasing after another burst of quick energy in the form of other insulin-generating carbohydrates. That, he says, makes people fat. He also comes down on traditional vegetarian diets for that same reason: "The insidious long-term consequence of a grain-based vegetarian diet is the constant elevation of insulin levels," he writes. I've been on the Zone diet for four or five years now, have lost 135 lbs. (! ), and have never felt better in my life. I've recently begun incorporating more soy protein in my diet as a result of reading this book, and I love it. I've learned how to prepare Zone meals that are quick, easy, and delicious (I never follow the recipes in the books, as they are too complicated). For breakfast, I have a Zone drink.... Nothing could be easier. They come in chocolate or vanilla, are delicious, and satisfy me for four or five hours. You could also make an omelet with Egg Beaters, soy cheese (delicious! ), and vegetables. For snacks, try soy nuts (toasted soy beans) with raisins and almonds, or an ounce of soy cheese with unsweetened apple sauce and almonds. For lunch and/or dinner, I've found that stir-frying is the way to go; say, tofu with black beans and your favorite vegetables (I'm partial to onions, broccoli, and cabbage). Or bake some cod (pour a little lemon juice, soy sauce and ginger over it), then stir-fry some vegetables. Or just open a can of tuna, add olive oil, maybe some balsamic vinegar, and garbanzos (chickpeas). I suggest you look through the list of "favorable" foods in the Zone books, pick out your favorites, memorize how much of these foods equals one block (not as hard as it sounds), buy some spices (soy sauce is a lifesaver for me, as are ginger, oregano, basil, and garlic powder), and just have fun experimenting with combinations. You'll be making up your own quick and easy recipes in no time. If I can be of further help, feel free to email me. I bought this book about a year or more ago. I have read it about 3 times, which is amazing in itself because I am not a big reader. While I can't say I follow all the "soy zone" rules, I do keep them in mind when preparing meals. I still haven't gotten the hang of figuring out blocks and all that stuff. So I do a lot of guesswork, and basically have cut out a lot of the "bad" carbs I used to depend so heavily on as a vegetarian. The recipes in this book are NOT useful at all. There are a couple that I can manage, and I usually change stuff around a lot. I wish the author would invest in a really good chef to put together recipes that I can actually use on a daily basis. Maybe they will re-write this book in the future....I would hope so! Since my half-hearted attempt at aiming my diet towards the "soy zone" - I have lost 7 pounds without even trying hard. Also, I usually get sick 3-4 times per year, and I haven't been sick at all since practicing bits and pieces of the soy zone. I wish I could get more into counting blocks and using the recipes. But it may just have to wait for a future version of this book. In the meantime, I plan on sticking to the guesswork, which seems to be working for me. Diet is a first and foremost matter of individual choice. Our food choices really do affect the health of the planet and the entire ecosystem in which we live, move, and have our being. Sears provides a useful service, by introducing the versitility of soy as a protein replacement for flesh-foods in a full-scale format. My problem is, the book is not careful enough with the details, and one can't be too careful about diet! Diet is a very relative and individual matter. For example, the book does not even go as far as to consider the gender distinction and the recommended diet is a high protein-oriented, 'male' diet. Most of us can actually do quite well with far less protein than Sears recommends. A more dangerous omission is the lack of a detailed discussion of the GMO soy crisis. Soy production is one of the largest arenas for genetically-modified seed. We don't really know what the effects of this type of biotech gene-altering, tampering with the food supply will create. The problem is not adequately addressed in the book. My advice is to stick with organic soy products and make sure they are labelled non-GMO (required by FDA regulations), unless you want to be a "guinea-pig" for this type of experimentation which, to reiterate, is currently rampant in commercial soy agriculture which is basically controlled by a few giant agro-corporations and not heavily regulated. I am absolutely baffled by testimonies on this site claiming that recipes from this book are difficult. Maybe they are new vegetarians, or are new to things like protein powder and stevia...but GET OVER IT. Everything is explained in an excellent glossary and I have never been to a health food or grocery store that would not be more than happy to help with finding an ingredient that is new to you. Part of eating a more healthful diet is getting over your fears of not knowing everything and asking someone for help. I have found every recipe in this book to be easy to make and AMAZINGLY good tasting considering the SHORT lists of ingredients (at least compared to vegetarian staple cookbooks by Mollie Katzen and the Greens). The need for women to convert amounts of ingredients, however, is VERY LAME...I am fairly used to making mathematical conversions but this seems unnecessary and fairly ridiculous. It doesn't seem that much more difficult to put amounts of ingredients for 3 block meals in parentheses behind the amounts for 4 block meals. But, once you make a meal...write the conversions in the book and then you'll eventually have all of the recipes converted. Christina Pirello turned to a whole-foods diet after being diagnosed with terminal leukemia at age 26. To the shock of her doctors, and without any medical treatment, she went into complete remission. She was surprised herself, as she'd been a vegetarian for more than 10 years and wasn't convinced that cutting prepackaged foods, sugar, and dairy from her diet would make that much of a difference to her health. I'm transitioning into a macrobiotic lifestyle and this book looked interesting to me, so I bought it. I really like each recipe I've tried. However, even though the author opens her book with a chapter entitled, "What is macrobiotics?" this book is not pure macrobiotics. Many recipes call for ingredients which should probably be avoided by newcomers to the practice. 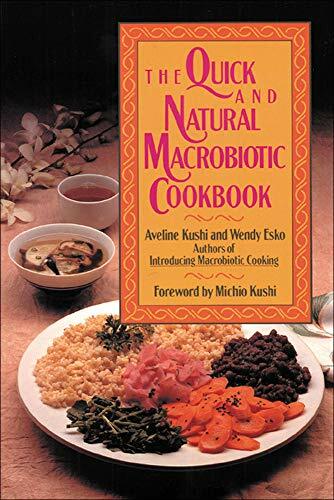 On the flip side, this book does seem like a good transitionary book for those desiring to try a more macrobiotic diet while still eating many foods which are familiar. To the author's credit, the word "macrobiotic" doesn't appear on either the front or back cover, so obviously she isn't making a claim to be die-hard macrobiotic. While some recipes are 100% macrobiotic, some others which are not may be altered to make them so, if desired. The beginning of the book describes many of the unusual and unfamiliar ingredients needed, items like kuzu, agar-agar, arame, hiziki, mochi, and shoyu, among others. Menu and shopping suggestions are given as well. I'm not vegetarian but I imagine this book being a valuable addition to a vegetarian's cookbook library. Just skip the chapter on fish. This cookbook is the solution for those "health-seekers" who want to eat by the rules (more fiber, more whole grains, less refined sugar, more vegetables). Many of the recipes are delicious, and it's nice to make something that tastes good but that won't give you pangs of food-guilt later. A few caveats: 1. This is not a pure vegetarian cookbook. She has a whole section on fish. The author does not eat fish herself, but wanted to more fully represent the macrobiotic philosophy. 2. This doesn't give a good look at the full spectrum of macrobiotics. I'm not an expert by any stretch, but from what I've read of some of the other macrobiotics founders, this seemed very incomplete. She seems to concentrate primarily on the yin-yang principle (in her next book she talks about the elements), but doesn't give a comprehensive overview of how those can affect certain conditions. Also, as another reviewer pointed out, she includes a lot of ingredients most macrobiotics shun (chocolate, garlic, etc.) She seems to bend the rules a lot when it comes to desserts. 3. Having said that, when the author thinks a rule is important, she runs with it. Don't even think of eating raw vegetables or fruits, any white flour, or certain vegetables, like tomatoes. All in all, I thought this cookbook was a valuable addition to my collection, but I didn't think it was a very good lifestyle guideline. This is a very, very good book if you're trying to add vegetables, reduce meat/dairy, or just eat healthier. She limits added sugars to brown rice syrup, barley malt, and the occasional maple syrup, although she's open about not really wanting to use maple syrup. Recipes are pretty comprehensive, everything from sauces to desserts. Information on how to organize a meal is limited, however; you have to search through the recipes to find one that might be suitable for breakfast, and her menus look like five-course meals. As for the macrobiotic issue (in which I'm !not! an expert), she gives the basics of macrobiotics and admits that some of the foods she includes are not usually part of macro cooking. She also doesn't include a lot of detail about macrobiotics, so I was left scratching my head at some of the recipes (I thought in macrobiotics you weren't supposed to eat foods not native to the area?). But if you're not aiming for a strict macrobiotic diet, this is a great book! The title of the book is misleading, because the book is comprised 90% of recipes, NOT techniques, wit& wisdom etc. It is not a guide, it is a recipe book. If you've decided to go macrobiotic and have access to ingredients like rutabaga and arame, this book provides you with many recipes, but for me it was totally inapplicable. I was expecting the guidelines for macrobiotic eating and cooking that I could apply to different ingredients at hand and thus was very dissapponted. While some of the meals take more than an hour there are some that take as little as 20 min. I like the varity of the recipes and helpful hints and instructions with pictures. I would highly recommend this book. Quick but not quick enough!! One from my "healthy books"
This book advises you how live healthier and what need to do. This type of book missing in my language and I am glad of this book. Publisher: Apple Tree Publishing Co., Ltd. In my eight years of vegetarianism, I find myself turning back to Laurel's Kitchen again and again. It never ceases to amaze me how the deceptively simple recipes create delicious food, time and time again. I suspect that the reviewer who complained of "lackluster recipes" just skimmed through, without bothering to prepare any of them. The strength of this book lies in its minimalist recipes, letting the quality of the ingredients shine through. In this respect Laurel's Kitchen is a welcome relief from the many vegetarian cookbooks which rely extensively on fancy techniques, ingredients, or equipment which you may not have at your fingertips. Not that I'm opposed to gourmet vegetarian cooking; but for day to day, simple, hearty food, I refer to Laurel's Kitchen before anything else in my cookbook library. Bonus material includes guidelines for new vegetarians, wider implications of a vegetarian diet, and a slew of handy nutritional charts. 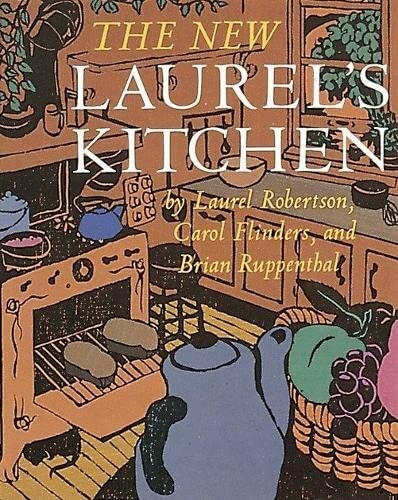 I first learned of Laurel's Kitchen in the mid-1970s when my parents gave my sister Laurel a copy for Christmas. Being an artist, I really admired the woodcut illustrations. However, I didn't start to use the book religiously until 1978, when I and all my grad-school friends decided to pursue a vegetarian life style. My copy, which I bought at the food coop where I volunteered is now in pieces, but I still use it regularly. I can count on the book to contain information about vegetables I'm not familiar with, and how best to prepare them, plus providing clear instructions for making such things as yogurt and sushi nori. Though no longer a strict vegetarian, having a husband and two children who like meat far too much to give it up just yet,I eat meatless meals at least several times a week. The recipe for Sultana's Spanakopita (a real winner!) has inspired a family favorite: broccoli pie, in which we've substituted broccoli for spinach. I bought this book because I was interested in the nutrition aspects of vegetarianism. This book has an amazing amount of nutrition information. It is a great resource for planning a complete vegetarian diet. I haven't tried any of the recipes yet, but there appears to be a great variety of recipes. The book is worth having just for the nutrition information. This was the very first cookbook I ever bought. I had drifted away from eating meat without even noticing, the first time I ever had to fend for myself in the kitchen. After a couple months of eating eggs and cheese I concluded I had to learn to really be a vegetarian. This book helped me understand the basics of a healthy diet that wasn't just "meatless", it had totally forgotten about meat. There are some recipes that are just plain nice to know about like the fruit compote from dried fruit, some of the delicious non-yeasted breads, (I'm too distracted to make good yeasted breads without my bread machine), and the various sauces for vegetables. It would be lovely to make everything from scratch like Laural and company did, but I just don't have the wherewithal to spend that much time in the kitchen anymore. I was vegetarian for 14 years but started eating meat again when pregnant the first time. Now that my children are getting older and able to appreciate foods that are combined, I plan to get out my copy of Laural's Kitchen and use it more. Even if they balk, I'll be adding various side dishes, some of the lovely sauces so I can dress up my servings of vegetables and introduce my kids to more vegetarian dishes. Even while I haven't been using these recipes, I've appreciated the comprehensive nutrient charts as a reference. Who else but Whole Foods Market could create a cookbook so fresh, so appealing, so full of valuable information, and so perfect for the way we are all cooking and eating today? Bursting with winning recipes, healthful cooking advice, cheerful guidance through the new language of natural foods, wine and cheese information, and a comprehensive glossary, this is a “thank goodness it’s here” kind of cookbook. The world’s largest natural and organic supermarket has created 350 contemporary recipes that are destined to become new classics. Whole Foods Market presents the most popular dishes from their prepared foods section, combined with brand-new recipes that showcase the wide variety of delicious ingredients available today. Far from “crunchy granola” fare, sophisticated recipes include Shrimp and Scallop Chalupas, Hazelnut Crusted Pork Loin, Thai-Style Green Curry Chicken, Griddled Sesame and Garlic Tofu with Wilted Bok Choy, Honey Jalapeño Barbecue Sauce, and Maple Butterscotch Macadamia Blondies. From meat and fish to tofu and vegetables, kid-friendly dishes to one-pot meals, the choices are dazzling, and with more than 200 of the recipes either vegetarian or vegan, the options are diverse. What are the different kinds of tofu, and how do I know which to buy? How should I stock a great natural foods pantry? What are good alternatives to wheat pasta? I've been a regular shopper at Whole Foods Market for years and I've been waiting for the company to put out a cookbook with some of their own great recipes, like Ed's Tantalizing Tofu, for the home cook. So when this book finally appeared, I was one of the first in line for it. Unfortunately, it's not what I'd hoped for. I have no complaints about the ingredients list, that's why I shop at WFM -- beautiful fresh, organic produce, all varieties of grain and pasta products, and a wide assortment of gourmet and International foods not found in other stores. For many of my favorite cookbooks [like Nina Simonds' Asian Noodles] Whole Foods Market provides one-stop shopping. The problem I have with the book is that of the half-dozen or so recipes I tried, I had to make repairs midway through the making, or the flavors or ingredients didn't come together as I expected, or the end product just plain didn't taste good. I was left with beautiful food made into lousy meals. If you're looking for great-tasting recipes tailor-made for WFM shoppers, I'm afraid you'll have to wait a little while longer. This one should be sent back to the test kitchen. I know what you are thinking (just as I was)-a natural foods/organic store cookbook can't have tasty recipes. This book will prove the naysayers wrong. It is filled with wonderful, great tasting recipes. I bought this book at my local Whole Foods store after tasting one of the dishes (Mediterranean Tuna Salad )of which samples were being handed out. One taste convinced me that I needed to buy this book. A lot of the same dishes in the book are sold at the Whole Foods Stores. The tuna salad is top-notch, as is the Sonoma Chicken Salad. The Tuscan Vegetable Saute is a good cold weather dish. It can be served by itself over rice or polenta or as a side dish. These are just a few examples of the diverse selection of recipes in this cookbook. There are hints/suggestions from the authors throughtout the book on how to alter the recipes to your taste, as well as descriptions and history of some of the ingredients. Every recipe has the nutritional explanation for dish. This book is a wonderful reference for any cookbook library.. Delicious recipes and a great reference. I have made six or seven recipes out of this book--mostly soups and vegetables. They have all turned out quite good, and popular with my non-health-food-eating friends as well. The Spicy Mung Bean Soup, Asian Braised Greens, and Red Beans and Rice are particularly delicious. The tips on natural cooking in the beginning are excellent, and make stepping into the kitchen a fast and simple operation. The book is also consistent with the rules of cuisine and flavor-building, and the recipes are geared towards maximum flavor enhancement (someone put a lot of thought into these). Use of sea salt (commonly recommended by naturopaths as 'healthier' b/c it contains natural iodine) may make things too salty--try using kosher salt instead in the recipes. Use of fresh spices, not old ones that have been hanging around the kitchen for years, is a must. And of course, only the freshest produce. This book is great to have around as a fast reference for a healthy meal because the recipes are simple for the most part, sound delicious when you read them and therefore tempt you to cook them, and ultimately the food is good for you. An added benefit is that you can easily refer to it if you forget your ingredients list when shopping at Whole Foods, as they stock it in the book section. It's one of my most frequently used cookbooks (although a little pricey for a paperback). Definitely a good buy if you like this kind of cuisine, and have a modest understanding of cooking. I'm in love with this cookbook. All of the recipes that I have done have turned out fabulous! My most recent adventure with this cookbook was to make the Labor of Love Cheesecake. The title is true to word; this cheesecake does take more effort than other cheesecakes, but it is well worth it. My cheesecake was silky smooth, not heavy as some cheesecake recipes come out. You could taste the cream cheese without feeling like it was a cake of cream cheese. The graham cracker crust was a nice change because of the added cinnamon & nutmeg. I love the fact that this cookbook looks at foods in all cultures and has given us a tangible way of making those foods. I've used the mojo marinade on both pork & chicken, side it with the cilantro-lime rice recipe and you have a fabulous meal. Each time I go into the cookbook I find something new and it's a great adventure. I became a vegetarian about 4 months ago. I bought about 10 vegetarian cookbooks so that I would have plenty of choices. This book has become my favorite. The recipes vary from simple to elaborate. There are also plenty of recipes that aren't intimidating to new vegetarians. Didi includes plenty of sidebar articles about different foods and cooking techniques. What a great cookbook! Every Saturday I plan my week of menus. I usually search through countless books, writing down ingredients to prepare for my trip to the market. I bought Didi's book two weeks ago and it has been the only one I have used. Her format is wonderful. The recipes are easy and incredibly creative. I use the book for hearty breakfasts, big lunches and light dinners (for the latter, may I suggest "African Tomato and Peanut Soup" served with brown rice and a light egg bread) With the left over egg bread, make the "Portuguese Sweet Bread French Toast" I haven't had real Portuguese Sweet bread since I left Boston. sigh. I usually find vegetarian cookbooks very bland and end up adding all sorts of extra spices. This is certainly not true of "Vegetarian Planet" Give it a try, you will be very glad you did. First, the good news: the cinnamon cookie recipe is great. Now for the rest: 1) layout is terrible - page numbers obscured by crosshatching, recipes that continue two pages away (because of a special section), 2) the recipes are very mediocre to bad - tried the Mexican chipotle lasagne (a family consensus of yuck), tried the stacked crepes with mushrooms (a lot of effort for mediocre results), tried the kim chee without fermentation (two bites and into the garbage). My family is vegetarian and I am always looking for new ways to dress up vegetables.I have looked through so many"vegetarian cookbooks"only to find the same recipes over and over again.But this is a star-offers fancy and ethnic menu ideas-its like your own kitchen can churn out delightful dishes like a restaurant for a fraction of that cost. Bernard Jensen is a brilliant and accredited nutritionist and natural healer. This book is an excellent source of nutritional information for the person who is willing to change their diet to understand that all ailments can be traced back to what we eat. Change your diet change your health. His philosophy is sound and scientifically accurate. You can make a difference in your health by choosing the correct foods. Food is the first medicine and Dr. Jensen describes the therapeutic values of many foods for specific ailments; lists nutrient availability of many foods and adds recipes to boot. This book is a must for anyone who is even contemplating natural healing or seeking preventive measures to ill health. Dr. Jensen is a gifted teacher and I highly recommend all of his published materials. 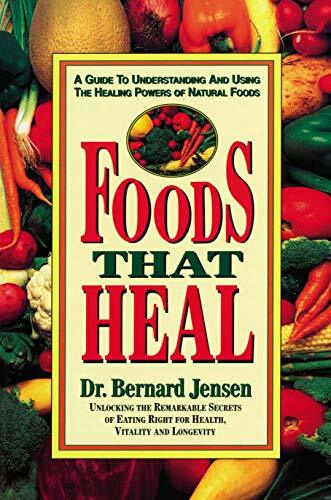 ... Dr. Jensen has compiled a superlative book on foods that heal. Each food profiled is like reading a mystery novel. One needs this information to stay healthy and well in this modern world we live in. Dr. Jensen has placed spiritual, psychological, as well as nutritional principles in his lifelong work to maximize wellness. He also recommends rebounding..
FTH is not famous, but useful!! FTH tells you about healing powers of more than 80 different kinds of natural foods. It shows the calories, vitamin, minerals of each foods. It also shows over 60 receipes of how to cook them with an easy way. FTH is a really "buyable" book!! Raw food is the new classic vegetarian cuisine. 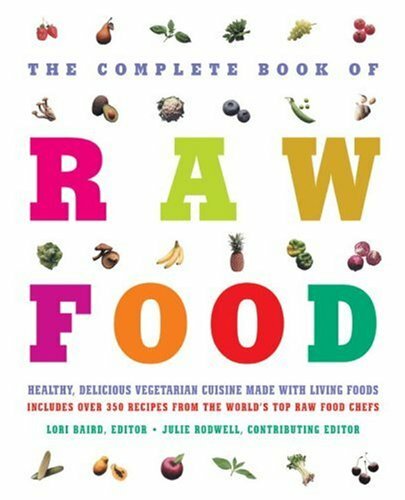 In this landmark collection of over 350 recipes, 49 of the world's top raw food chefs share their tips on how to create fabulous meals using the freshest live ingredients, as well as expert advice on choosing the best ingredients and tools. They also offer preparation techniques and presentation tips that will have you making dazzling, delicious, healthy meals in no time! The tasty raw food creations featured in The Complete Book of Raw Food allow the beauty and flavor of fresh fruits and vegetables to really shine. Raw foodists believe that heating foods above 105 degrees to 115 degrees kills their health-giving enzymes. But if you're worried that raw food means salad and carrot sticks, you're in for a surpriseamong the recipes featured are traditional favorites like Lasagna, Zucchini Bread, and Easy Pad Thai. Made completely from living foods, these creations are packed with essential vitamins and mineralsand more importantly, they're delicious! This is a great raw food book. Simple recipes without a huge, long list of hard to find ingredients. Lots of variety, too. Try the Roasted Bell Pepper Cheese and Mushroom Risotto. This book is perfect for the beginner, the novice, or the advanced. There are miles and miles of recipes from the top raw chefs. You will never run out of recipes to try. Pick one recipe to try each week and spruce up your food arsenal. I have been eating live foods for about a year...I wish I would have found this book sooner....it can replace all of the other cookbooks that I purchased. Whether you are 100% raw or 10% raw this is a great cookbook to own. As a longtime vegetarian and proponent of whole foods, I've greeted the raw food movement with some admiration and some skepticism. Eating lots of vegetables and nuts in as natural a state as possible can indisputably enhance your health, and some of the recipes in this book offer delicious and non-intuitive flavor and texture combinations. But I believe quite strongly that the "movement" has a very unsavory cultish side to it, and following this diet strictly can lead to undernourishment if not anorexia. Following vegetarianism as long as I have, I've had the distress of seeing more than one friend grow alarmingly thin and frail on similar, obsessive diets. And sorry, but the "science" behind a lot of the movement's proclamations on enzymes and what heat does to substances are just pure snake-oil junk science. Most of these recipes are very, very time intensive, and many require dehydrators, large sprouters and expensive juicers. By time intensive, I mean they require chopping, blending or processing, mixing and then 12 hours or more of dehydrating. It's not a cookbook you can leaf through to decide on what to make for dinner tonight. The majority of the dishes are for desserts, sweet soups, and the like. Based on my personal observations, that is because people on raw-foods diets become obsessed with "healthy" substitutes for "junk food." And so you see recipes for things like "pizza crisps" and raw approximations of "refried beans" in this book. But some of the recipes, like the sprouted chickpea hummus and guacamoles, are delicious. The dressings and nut-lump-things are OK if you don't mind the grassy/woody taste of soaked raw nuts. The "breads" I've tried bordered on inedible. Technically speaking, the editing in this book is atrocious. I don't remember the last time I read something with so many typos, omitted words and flubbed tables. Additionally, there is an interminable section near the back filled with pointless, self-serving bios of the contributors. This should be another tip that you're in authoritative, lionizing guru-land. You can take some nice dishes and approaches from this book, as long as you're aware that it's the macrobiotics of the '00s. Bottom line: It's a diet of raw vegetables, fruits, seeds and soaked nuts. It is nothing more, and it's not magic any more than some pill that claims to give you instant health. Raw Food: Healthy, Delicious Vegetarian Cuisine Made With Living Foods is more than a cookbook featuring 350 recipes for preparing uncooked fruits and vegetables; it also offers a wealth of experience and insight into juicing, cutting, drying, and other methods creating delicious raw meals. Whether one is reluctant to heat foods above 115 degrees (F) in order to preserve their health giving enzymes, or simply wants to enjoy the natural flavor of nature's bounty, Raw Food is a superb primer and resource for enjoying the best of the best. Includes instructions for making great salads, soups, smoothies, cheese substitutes, and more. Note that Raw Food is a vegetarian cookbook and does not cover sushi or other fish and seafood preparation. This book is packed with recipes and preparation skills from the top raw chefs around. Well edited and beautifully presented. An important book to own. I met several of the contributing chefs at a recent event...over 40 in total...each with their own unique style. From gourmet raw cusine to simple every preparations and everything in between, this book has it all. It's nice to be able to experiment with such a range of recipes. Color pictures are included that show select final dishes and serving suggestions. Complete index, resource directory, shopping hints, and more are also a bonus. Vegetarian Express claims that each of its recipes canbe prepared in 28 minutes or less. If preparation time sometimesstretches to 40 minutes on a few of the more complicated recipes, ithardly matters, for you end up with an extraordinarily delicious, low-fat meal in as much time as it takes for the local pizza place todeliver one of its greasy pies. This book was written with busy peoplein mind: folks who like to eat well but don't have the time to spendsteaming, blanching, soaking, and simmering after a full day of work.Instead, Nava Atlas and Lillian Kayte encourage cooks to use preparedfoods as often as possible: canned chickpeas, frozen spinach, andquick-cook rice add up to a blissful curried chickpea stew; frozencorn, canned olives and tomatoes, and tortillas combine to make adynamite Mexican lasagna. The book is divided into sections on grains,pastas, sandwiches, and more, including recipes for side dishes tocompliment each entree. This book is absolutely the best Vegitarian cookbook that my wife and I have encountered. Not because the recipes are the most elaborate and mind-blowing that we've encountered, but primarily because they're not. The meals are all tasty enough to please my "meat and fried food" parents, the ingredients are available at the local grocery store (no trips to Zimbabwe to get some obscure plant), and they all take a very short amount of time to prepare. These are the primary problems that we've encountered with books like Moosewood; the ingredients are exotic at best, they take hours to prepare, and they taste extremely bland. Every recipe that we've tried from this book during the year-and-a-half that we've had it has been very pleasing, very flavorful, and the standard ingredients are those that we can expect to have around at any given time. My husband and I are long-time vegetarians and we both love this book! The text is well-organized and a pleasure to use when hurrying out to the grocery store. The recipes are generally quite easy to make and they really do keep to 28-minute meals! Almost all of the recipes we've tried have been delicious (some just weren't right for our particular tastes) and I feel like we've uncovered a treasure of beautiful and simple-to-make delights. I love making new recipes these days...and my husband loves eating them!!! I was dissapointed with this book. The meals are not that quick and easy. There is a good variety to choose from, and they look tasty, but I haven't made too many due to the complexity of the recipes. Well, I really wanted to like this book. I read it like a novel then rolled up my sleeves to try some recipes... I ended up throwing a lot of food, as I couldn't get anybody else in my family to eat them! Even I could not bear to eat the leftovers. And the recipes weren't as quick and easy as I wanted. Maybe I'll have better luck with a cookbook by Jeanne Lemlin, which I will order next. TV's Christina cooks more than 200 recipes. 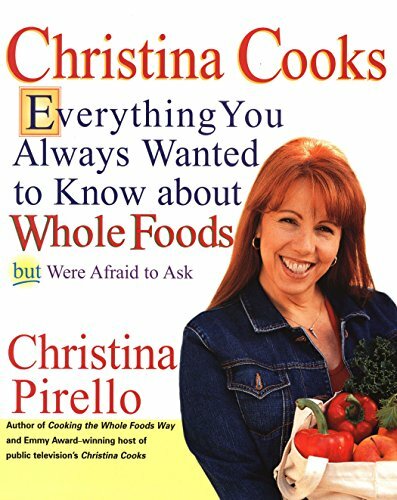 Public television cooking show host Christina Pirello is the woman who put the fun back into healthy cooking. In Christina Cooks she's responded to the hundreds of questions that her viewers and readers have put to her over the years-with lots of sound, sane advice, hints, tips and techniques-plus loads of great recipes for scrumptious, healthy meals with a Mediterranean flair. An introduction to the world of edible insects, complete with recipes and color photographs. * Includes an historical look at the use of edible insects in * indigenous cultures. * Provides information on where to obtain insects and how to store and * prepare them.Includes over 60 gourmet recipes, complete with * stunning color photographs. many other nutrients. As the world heads for food shortages in the next century insects can help meet humanity's growing nutritional needs. Julieta gives great nutritional advice on different bugs and descries each bugs particular flavor in reference to things common that we know of.... it is well written and very informative from calories to essential amino acids to proteins and vitamins... the book covers different countries in it's concise and informative beginning. I also liked the fact that the author gives you the actual family and genus name of the species. the photos however are why i gave the book 4 stars.... most of the photos i feel as if i had already seen in "man eating bugs" because the same photographer helped publish both books... i never really tried the recipes of course.. but julieta does give helpful resources and advice on breeding your own bugs for food! Loved it read it several times.... get it for your collection! It transform's you in to a bug eater! for life. This is the best book i have read about edible insects, i find it rare but exciting, after you read this book you will go to your garden and gather some insects. 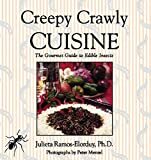 This book contains some great recipes with a south-of-theborder-flavour, but all the same, you may find some of these bugs a tad bit exotic . . . where in the world can you get a half-pound of tree-hoppers anyway? So this might be a bit much for the novice without special resources, but on the whole is well worth the money. The author of this book is probably the world's foremost authority on entomophagy. I consider this book the best entomophagy book in print. The book is thorough in its coverage of the value of insects as human food. The author is a superb cook and the recipes are delicious and very artfully prepared and photographed. Great book with great recipes! Proving that tofu can taste good! I had reservations about this book since I usually only buy cookery books with photos, and this book has none. That said, I thought I'd give it a go, since the food at the Moosewood resaurant is so great. The focus is on cuisine from around the world, with each section including an interesting precursor to the region, detailing a little history of the area/writer/recipes. It's a rare cookery book indeed in which all the recipes you try turn out well - but this is certainly one of them. This has now become my staple recipe book, and comes thoroughly recommended. This is my most-used cookbook. 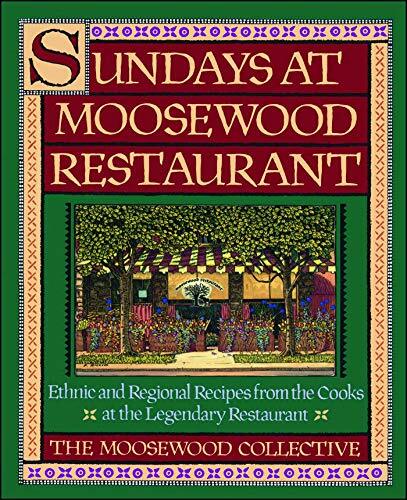 I've used Sundays at Moosewood so much that it has fallen apart into three pieces, and I need to buy a new one. The book is a good read--all of the authors introduce their regional sections with an essay about the culture and cuisine of, say, the North African highlands (my personal favorite). This is followed by a very satisfying variety of recipes from each area covered. The recipes are good! Dishes from Ethiopia, the Philipines, Japan, South Africa, and even England have become staples in my kitchen. I love this book. How, exactly, is this book misleading? Nowhere on the cover does it claim to be vegetarian. And where is it inscribed that Moosewood must always and only every time put out vegetarian recipes? Pay more attention next time. This is not a case of a book being misleading, but of readers being too lazy to double check the index. While the vegetarian recipes in "Sundays at Moosewood" are outstanding, it loses points for being misleading. This is NOT a vegetarian cookbook: there are recipes containing fish, shrimp, and shellfish, all of which by definition are animals. Mislabeling like this only makes things harder for those of us who really are vegetarian or vegan. Bottom line: if you want some great ethnic food with an overall vegetarian emphasis--because most of the recipes are vegetarian--it's a great cookbook. But vegetarians (whether ovo-lacto or vegan) don't eat fish, shrimp, oysters, clams, or other aquatic animals, so don't be misled into thinking that this is a truly vegetarian cookbook.